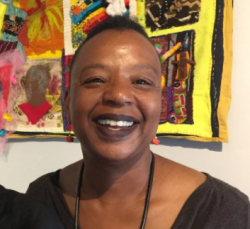 IBe' Crawley is an arts educator who consults arts officials, museum staff, business owners, educators and practicing artist, to deliver arts and education programs. In addition to maintaining a sculpture studio practice and writing community based education curriculum, IBe' also documents African American stories and experiences through videography and photojournalism. For more than 30 years, IBe' has used storytelling and visual arts for expressing and healing, memory care, and legacy building.